When the Heavens Meet the Earth brings together selected works from Robert Devereux’s contemporary art collection, highlighting his commitment to emerging artists who challenge Western preconceptions of, and hegemony over, cultural expression and contemporary art. More than thirty-five works have been brought together and are part of his Sina Jina Collection, named after a restored merchant’s house in Lamu, Kenya. It is literally called ‘the place with no name’. As a collector, Robert Devereux is focused upon supporting artists and giving them the confidence to develop their practice. In an ambitious, high-density hang, the exhibition includes works by artists from Benin, Cameroon, Central African Republic, Democratic Republic of Congo, Ethiopia, Gabon, Ghana, Kenya, Mali, Mozambique, Nigeria, South Africa, and Zimbabwe. Several live and work in Europe and the United States of America but draw much of their inspiration and artistic idioms from their trans-national roots. The works cover multiple media, from photography and painting to sculpture and film. Impactful, provocative and playful, the works explore everyday life, politics, human rights, LGBT+ representation and identity. In 2010 Robert Devereux recognised how hard it is for many artists to make a career in art, particularly those based in Africa, a continent he had grown to know and feel connected to. As a result, he placed for sale through Sotheby’s, four hundred and sixteen works from his collection of post-war British art. The proceeds helped establish The African Arts Trust (TAAT), a body that continues to fund grass roots organisations in expanding opportunities for artists. This exhibition offers the UK a rare chance to see further evidence of Robert Devereux’s support for artists. 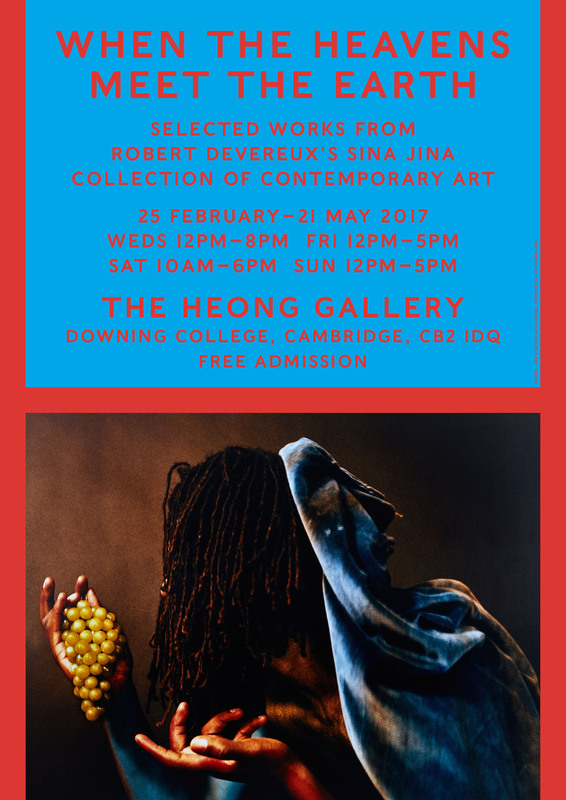 When the Heavens Meet the Earth is the fourth exhibition at The Heong Gallery, and continues Downing College’s commitment to presenting significant international art in Cambridge, with the aim of encouraging discussion and debate amongst both students and residents. Robert Devereux is a Downing College alumnus. Robert Devereux has long been involved in the world of contemporary visual arts. He has served as chairman of the board of Frieze, the African Acquisitions Committee at Tate and as an advisor to 1:54 Contemporary African Art Fair. Published to coincide with the opening of the exhibition, the fully illustrated catalogue of When the Heavens Meet the Earth will contain texts by collector Robert Devereux, curator Tessa Jackson OBE, artist Petersen Kamwathi and art critic and writer Sean O’Toole.